Hello, this is the Freeshell / SDF Web Page of Supratim Sanyal. IMPVAX is a DECnet Phase IV Area Router serving as the United States East gateway to HECnet - the hobbyist DECnet network. It is also the Routing Node for all Digital and non-Digital systems communicating over DECnet at SANYALnet Labs. 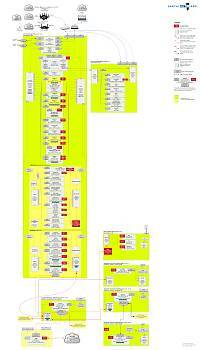 It runs Process Software's MULTINET to communicate with other DECnet nodes and uplink to HECnet. It additionally uses a VDE (Virtual Distributed Ethernet) switch to communicate with rest of the DECnet nodes in my home. IMPVAX runs in the cloud inside an Amazon AWS EC2 instance running Ubuntu 14 at sanyalnet-awsec2-1.now-dns.org. Accounts for HECnet members on request. Ubuntu 14.04.5 was the last ubuntu release with workable DECnet-Linux as well as classic AppleTalk protocol support built into the kernel. Windows Server 2003 has built-in AppleTalk Phase-2 support. WEXPEE is configured as a seed router for my hobbyist AppleTalk classic network. TELNET and SSH Accounts for HECnet members on request. This SheepShaver emulated Apple Power Macintosh 9500 running MacOS 9 (hosted on ubuntu 17.10) communicates over classic AppleTalk Phase 2, and DECnet Phase IV using Digital Pathworks for Macintosh. Running 16-bit Microsoft Windows for Workgroups 3.11 on top of IBM PC DOS 7.1 (AKA IBM PC DOS 2000), this i386 PC has dual network adapters, one dedicated NIC each for Internet Protocol (IP) via Microsoft TCP/IP, and DECnet via DEC Pathworks 5.1 for DOS and Windows for Workgroups. In addition to Digital's Pathworks 5.1 suite and Microsoft Networking protocols, it is loaded with nostalgic goodies, including Xitami's httpd web server, Quarterdeck's QEMM386.SYS for XMS, EMS, UMB and high memory management, Norton Utilities for DOS and Windows, Norton Desktop, PC Tools Desktop, PC Tools for DOS and Windows, MS DOS 6.22, 4DOS, Microsoft Office, Microsoft Visual C++, Opera web browser, numerous audio and video players, multimedia tools, win32s 32-bit extension for Windows 3.1, classic games and more. 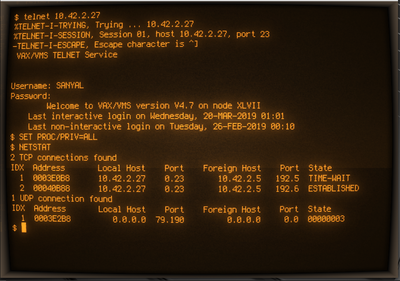 This VAX runs the classic VAX/VMS 4.7 operating system with DECnet. It is an implementation of Andy Hoffman's awesome VAX VMS 4.7 distribution, and includes BASIC, BLISS-32, C, COBOL, FORTRAN and Pascal compilers. TCP/IP communications on this VAX VMS 4.7 node is provided by CMU-OpenVMS/IP (also referred to variously as "CMU/Tek TCP/IP", "CMUIP", "CMU/IP", "CMU TCPIP") version 6.3 which supports VAX VMS 4. For more information on CMU TCP/IP for VAX VMS 4.7, see Installing CMU TCP/IP 6.3 on VAX VMS 4.7. This VAX is used for experimenting with various mechanisms to communicate over DECnet with other nodes, including MULTILINK, HECnet bridge.c program, VDE and more. This Basilink II emulated Apple Macintosh IIci running MacOS System 7.5.5 (hosted on OpenSUSE Tumbleweed) communicates over classic AppleTalk and DECnet. DECnet is implemented by Thursby Software TSSnet for Macintosh, which was the basis of DEC PathWorks. The DECnet Phase IV executor identification string is "TSSnet® V2.4.0-MacIIci V7.5.5". RST101 is a SIMH PDP-11/73 node running RSTS/E operating system version 10.1-L with DECnet/E 4.1. Marketed by DEC as a "MicroPDP", the PDP-11/73 featured 15.2 MHz DEC J-11 microprocessor chip-set with Q-Bus and supported a maximum of 4 MB of memory. TWENEX is a DEC PDP-10 (also called DECsystem-10) mainframe running the latest famous Mark Crispin's Panda TOPS-20 distribution. It is emulated under Linux by Ken Harrenstein's KLH10. It has a GUEST account. A dynamips/dynagen emulated Cisco router that establishes GRE Tunnels to transport DECnet over IP. Also serves as a AppleTalk Phase-2 seed router in my AppleTalk network. Paul Koning's DECnet implementation in Python. This runs as a user-space DECnet routing application on any platform that supports Python. A dynamips/dynagen emulated Cisco router that establishes GRE Tunnels to transport DECnet over IP, connecting to other Cisco DECnet Area Routers on HECnet. Also serves as a AppleTalk Phase-2 seed router in my AppleTalk network. A periodically updated summary of DECnet neighbors and routing information generated by an expect script is available here. IBM PC DOS is MS-DOS compatible Disk Operating System for IBM PC family of computers. PC DOS 2000 is basically PC DOS version 7.1 which is an upgrade from PC DOS 7.0 with added year 2000 compatibility. A Hercules Hyperion emulated IBM S/390 Mainframe running on OpenSUSE Tumbleweed host. The S/390 mainframe itself runs Ubuntu 18 s390x Bionic Beaver port for S/390. More information about this server: Bionic Beaver on z/Architecture: My Personal Mainframe IBM S/390 running Ubuntu 18 Linux on Hercules on OpenSUSE Tumbleweed. Also, here is what IBM say in their archives about S/390 Parallel Enterprise Server. A SIMH-emulated MicroVAX 3900 running NetBSD/VAX 8 operating system. This is the only SIMH for Win-32 instance running under Windows; all other SIMH instances in SANYALnet Labs run on Linux variations. A SIMH-emulated MicroVAX 3900 running OpenBSD/VAX 5.8 operating system. The OpenBSD/vax port was discontinued after the 5.9 release. A SIMH-emulated MicroVAX 3900 running Quasijarus release of the ancient 4.3BSD VAX operating system. "Quasijarus is a project of the International Free Computing Task Force (IFCTF) led by Michael Sokolov to indefinitely continue the maintenance, support, and further development of the classic line of Berkeley UNIX on the classic VAX hardware." - official Quasijarus web page. An emulated Digital AlphaServer ES40 running Gentoo Linux for Alpha. Gentoo Linux for Alpha is still maintained and provides a modern Linux distribution for the legendary Alpha architecture. Installing it on an emulated AlphaServer is not trivial, I am grateful for the help from Astr0baby who did the hard work while also documenting it here and here. A SPARCstation-5 running Sun Solaris 2.6 SPARC, emulated using QEMU hypervisor on Linux. A SPARCstation-5 running Debian 4 "Etch" for SPARC, emulated using QEMU hypervisor on Linux. A Sun-4U (UltraSPARC-1) workstation running OpenBSD SPARC 64 bit operating system, emulated using QEMU on Linux. This is a virtual DECstation 5000/200 emulated by the gxemul emulator. The DECstation 5000/200 runs DEC Ultrix operating system. This is a very special virtual Honeywell 6180 running the pioneering MULTICS operating system under a custom 32-bit Linux build of the DPS8M emulator received with thanks from Multician Jeffrey Johnson. Among numerous other things, Jeffrey runs the public Multics site ban.ai, and with wizardry made MULTICS available over DECnet in the HECnet network via the DECnet node BANAI. This is a virtual emulated SUN 3 workstation running NetBSD/Sun3 Amnesiac 1.6, running under the TME (The Machine Emulator) hypervisor. I am grateful to Mark Abene who pointed me to this great little emulator and instructions on how to install NetBSD on a SUN 3 at the HECnet mailing list. I used to run Washington Bangla Radio on Internet (WBRi) and an associated south-Asian entertainment news portal that reached alexa rank of under 14K at it's peak, making it more popular than many mainstream newspapers in India. Along the way I became an expert in streaming technologies, SEO, video and audio editing and production, photography and image manipulation, LAMP-based high-performance web servers and internals of the Drupal CMS, as well as the Zencart online shopping application which I modified for digital audio sales and downloads way before iTunes became popular. The service still exists and is run by a buddy now. Free Online Sinclair ZX Spectrum Emulators, etc.